One of the difficult things to accept about running a business is that complaints are an inevitable part of business – after all, it is impossible to please everyone all the time. Instead of looking at complaints negatively and feeling as though the customer is going out of their way to destroy the business or attack you personally, look at is as a way to improve the business. It’s a simple change in mindset but one that can make a world of difference. Customers who take the time to make a complaint are doing a business a favour. These customers care enough about your business that they want to communicate their concerns with you and also believe that you’re in a position to solve the problem. Customer complaints highlight key areas where your product needs improving, your systems need updating or your service needs upgrading. Customer complaints can identify staff members who need more training, a refresher course, or closer supervision and helps you identify the need to introduce better business policies and procedures. Complaints help motivate and drive staff to improve the work and therefore improve the service culture at the business. The things customers complain about may present new business opportunities for increasing revenue, reducing operational costs, solving problems and increasing value. Customer complaints (particularly those along the lines of “company A” does it this way) can provide you with valuable competitive information and letting you know what others are doing that you are not doing (yet). You learn which customers are willing to speak up and that helps you better understand the business’ customers. These customers can (and should) be invited to participate in customer focus groups, surveys, panels, beta-tests, onsite visits and other research activities. Most upset customers simply walk away and then complain about you to their friends, colleagues, acquaintances and family members. Those who take the time to let you know are giving you another chance! On WOMO, we’ve seen many times where negative feedback handled properly, has led to the business rectifying a major problem and winning over a customer for life. Customers complaints are inevitable (even for the best businesses), so look at the positives and how the business can benefit from them! Check out our article on 4 Steps To Manage Customer Complaints in Heat of the Moment, but make sure that your business has simple and effective policies in places to handle customer complaints. When customers are describing their problem or explaining what they’re looking for, they can immediately sense when somebody is just waiting for a break in the conversation so they can start their sales pitch. To really listen to the needs and wants of the customer, you must briefly forget your goals and think about the customer. If you can solve their problem, then you’ve reached your goals. Remember, it cost five times more to acquire a new customer than it does to retain an existing one, so make sure you remember your best customers – those are the people who have helped you get to where you are right now! Showing loyalty to your customers doesn’t have to be a big thing. It might be inviting them to try new products or something as simple as sending them a personalised message thanking them for their support. For customers who have left you a review, reply publicly and show them how grateful you are for their support! Customers understand that if you’re a sole trader or have a small team, it might be hard for them to reach you the first time round. If people leave messages, make sure you call back within a reasonable amount of time – within 24 hours at the most (just don’t make promises you can’t keep!) Try to offer multiple ways to ways for them to contact you – by phone, email, social media, or live chat. An overwhelming number of WOMO users highlight poor staff attitude as a big turn off when choosing a business. There is nothing more discouraging than speaking to a staff member that clearly doesn’t want to be there. Keep in mind, the problem can be easily resolved by the customer – they’ll just go to one of your competitors. Do your staff put customers off? In a recent survey conducted by Word Of Mouth Online, we asked our members to comment on the customer service they receive from Australian businesses. An overwhelming number of respondents highlight the attitude and demeanour of staff members as a factor on whether they will use the business again. But it’s not just rude and unpleasant staff members that customers find off-putting. Many find the “lack of product knowledge is a big turn off”, especially since customers can find most of the information they want online, with over 78% of all purchases starting with an online search. “Product knowledge is a vital selling point, as I always do a lot of research to understand what I am purchasing is what I’m am looking for or how does it works, or interacts with other products that I already have at home,” says a WOMO reviewer. “Pay peanuts, get monkeys [sic]. Look after your staff and train them well. Hire for ability, not looks or how cheap they are. Well treated staff work harder because they care about what they’re doing”. Good customer service all comes down to the person providing it and businesses need to ensure that the staff members aren’t just selling a product or service, but an experience with the business. Businesses need to look at building a culture based on providing good customer service and focus on rewarding staff based on customer service outcomes. Providing feedback on how staff can improve, but also commending them when they’ve done good work builds their confidence, and staff who are encouraged by your support will look to work harder. When a business gets a new positive review, congratulate your team for making that happen! If someone was named in the review because of the service they provided to customer, reward them! When it comes to setting a benchmark for customer service, managers and owners need to lead from the front and illustrate to their staff how to build relationships and engage with their customers. Sometimes the best training for staff is to lead by example, and really demonstrate that customer service is the number one priority. Managing customer complaints can be extremely challenging (that may just be the under-statement of the year). 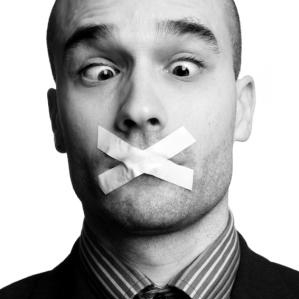 Unless you want to dig yourself in deeper, there are several things that you definitely should NOT say to customers. It’s easy to find yourself uttering something which will only worsen the situation, so take our advise and don’t do this. It’s true, the customer is not always right, sometimes, they are clearly wrong. That being said, you should never tell them that they’re wrong – it will only escalate the situation. Instead say: “I’m really sorry you feel that way” or “I’m sorry, it’s certainly not our usual way of operating to do that here” and try resolving the issue while not telling them explicitly that they’re wrong. Similar to the first point, the customer is not always right but that doesn’t mean the business are not able to solve the customers problem. Telling them that it’s not the business’ fault is little comfort to them and instead will make them feel that if it’s not your fault, then it’s their fault. Instead say: “What seems to have happened is…. 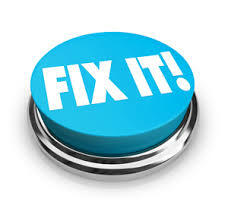 but I’ll see if we can resolve the situation by…” and move on from who’s at fault and focus on providing a solution. Even if that is true, businesses should never say this to a customer because it shuts down discussion. You’re essentially telling the customer that you’re finished and that there is no amendable solution. What’s important to realise is that you may be finished with the customer, but they’re not done with you. An angry customer doesn’t stop feeling angry when you tell them there’s nothing you can do. Their problem still exists. The likely outcome is that they will leave feeling disgruntled and even more annoyed then when they first contacted the business. They then talk to others, and given that most consumers are now internet-savvy, they share their experiences online too. Instead say: “I wish I could be more help, but what I can do in this situation is…”; again focus on providing a solution (or at least demonstrating that you’ll go out of your way to help this customer). Fair enough, not everyone in a business is going to know everything. That being said, someone in the business should be able to answer the customer’s question. Simply saying that you don’t know isn’t an adequate answer – find someone who does know (or look it up – that’s what Google is for!). Passing on the blame to someone else or another department in the business is not going to help the customer. The customer isn’t going to feel any better that they know it’s not specifically your fault, they just want someone to help them and own the problem. When you’re looking for easy tips on how to provide good customer service, sometimes knowing what not to say is sometimes just as important as knowing what to say. Managing customer complaints and problems is part of being in business. 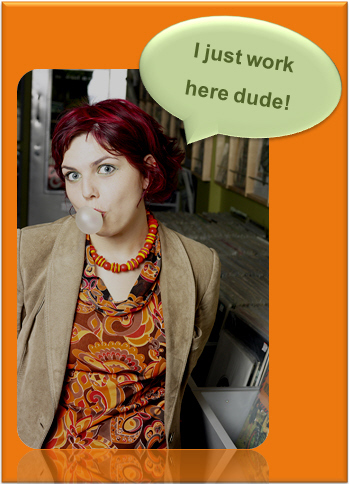 At some point, everyone has to deal with an unhappy customer (yes, even the best businesses). The challenge is to figure out how to handle the situation in a way that leaves the customer thinking you operate a fantastic business, even though they’ve experienced a problem that might have slipped through. A well managed complaint can potentially turn a lost sale into a loyal, lifetime customer. We’ve come up with four easy steps on how to effectively deal with customers complaints in the heat of the moment. Firstly, don’t get defensive, but instead try to listen and really understand the customer’s point of view. Remember that the customer is not attacking you personally; they have a problem and they’re upset (and this can manifest in different ways in different people!). Realise that the customer is complaining because they hope that you can help solve their problem. Repeat back what you hear and show that you’ve listened. The more information you can get from the customer, the better you will understand their perspective. Ask questions and establish the details and facts of the complaint. Remember, your goal is to solve the problem as best you can. The customer needs to feel like you’re on their side and that you empathise with their situation. Be gracious, keep your cool and remember, it doesn’t really matter whose fault it is. Don’t blame another person or department and don’t put the blame back onto the customer (although they may have played a role in the problem). Just say, “I’m so sorry about that”. The great thing about the simple act of apologising is that when they sense that you are sincerely sorry, it usually diffuses the situation. Having a simple complaints process is the first step to managing customer problems – be sure your staff are aware of, and have been trained in, these complaints steps. Customer complaints are nothing to be ashamed of, as all businesses experience problems from time to time. What matters is how the business responds when something does go wrong. Remember, the greatest asset of any business is its customers and a complaint is handled effectively, the customer can end up being a passionate advocate for your business and brand. 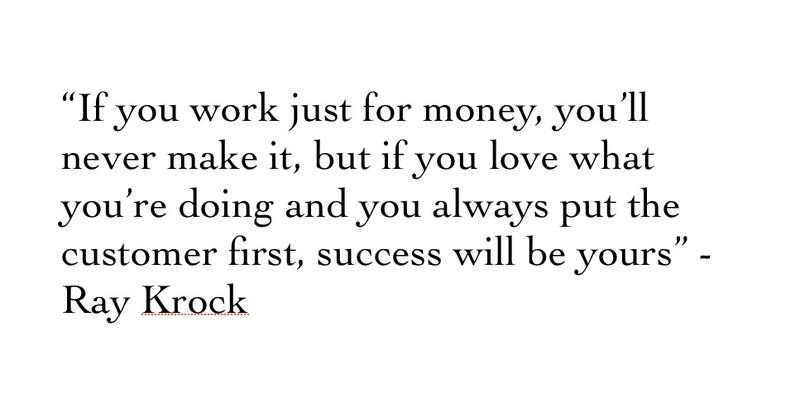 Starting and growing a thriving business is definitely not easy… BUT the recipe is simple. By getting the of fundamentals right (providing a great service and encouraging customers to review you online), small businesses can essentially forget about needing to do sales and marketing – because your customers do this for you! This leaves you free to focus on great service delivery. Which means that your customers will be even happier. When customers review you online, they are essentially building your online reputation while also improving your SEO (search engine optimisation). This means that more people that are searching online for a business like yours will find YOUR business. And when they click for details, they’ll see all of your customers saying glowing things about you. Recommendations from other people are the most convincing type of promotion you can do. 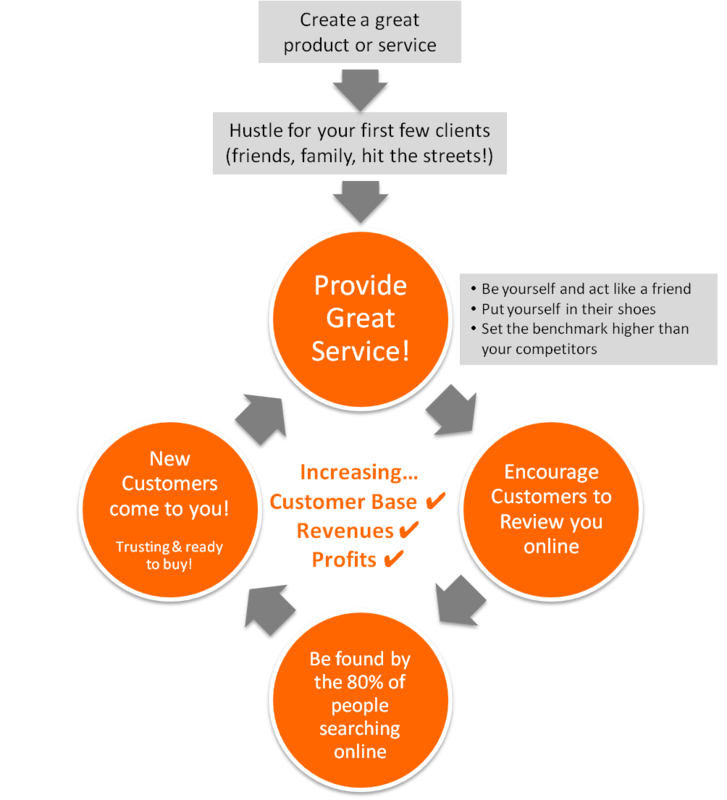 Word Of Mouth Online’s Happy Customers Program gives you all the tools you need to attract lots more customer reviews. Click here for details. 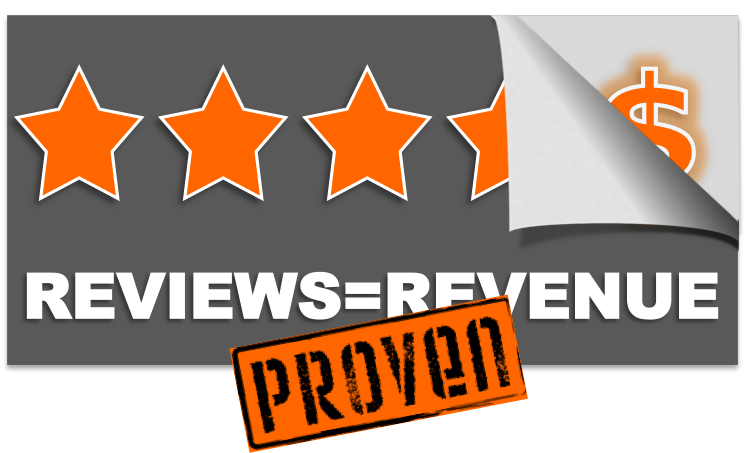 Do online reviews actually increase revenue? Regular readers here will have seen many case studies showing a wide range of businesses using customer reviews to help them get found online, get trusted and generate more revenue. But now studies from two prestigious universities have gone to the trouble to prove the connection between reviews and business success. The first study is from Harvard Business School and looks at the positive correlation between online ratings and revenues (based on a large sample of restaurants in Seattle, US). They also found that this effect is much more pronounced for small, independent businesses (rather than large chains). This makes sense as if you think of an extreme example like McDonalds, everyone knows what to expect from any McDonalds store and so online reviews are less important. In contrast, the independent burger place down the road has less of a brand reputation so their online reviews make a huge difference. The variation largely depended on how much other information was available about the restaurant – for businesses where not much other information existed online, the extra half-star rating caused them to sell out 27% more frequently (than similar restaurants with a half star lower rating). Wow! That’s really significant! If there’s ever been any doubt about the relationship between word of mouth online reviews and consumer purchasing decisions, these two studies show that there is a definitive causality. Yes, great customer service increases patronage, but great customer service together with great online reviews, brings even more patronage and revenues. WOMO.com.au is Word Of Mouth Online - Australia's biggest customer reviews website. Every day, the WOMO website helps thousands of people find the best businesses and avoid the worst - all based on customer reviews.